Papillons and other small housedogs require plenty of accommodation to their basic needs. Papillons have so many charms. They're smart, beautiful, wonderful companions, and decent watchdogs for their size. As with many small dogs, easy house training is not a papillon's strong suit. That doesn't mean it can't be done -- it will just be on your pap's own timeline. While Papillons excel at many tasks, housetraining is a different story. The rescue group Pap911 says bluntly, "Many are very hard to housebreak." 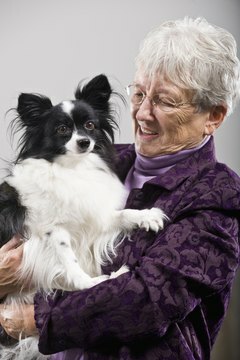 Some people surrender their papillons to shelters and rescues over this issue. Tiny dogs like paps realize how vulnerable they are, so might not feel safe taking a potty break in the great outdoors. They're also more sensitive to cold and wet. Why go outside in the rain when you can take your break indoors? Consistency is a key to housetraining your papillon buddy. Feed and walk him on as regular a schedule as possible, so he learns to trust it. When he "does his business" correctly outside, praise him to the sky. If he has an accident indoors, don't scold him unless you catch him in the act. He won't know why you are cross with him for something he did 15 minutes ago. Observe your dog carefully. Sometimes papillons try to signal the need to go outside, but you're not tuned in. If you want a reliably housebroken dog, you have to be reliably aware of his needs. If your little pal heads for the door when you stand up to go to the kitchen, it's probably a good idea to take him out. If your buddy never seems to "get" the idea of waiting to do his business outside, take him to the vet for a checkup to make sure there isn't a physical problem. Think twice about using puppy wee pads or putting down newspaper for convenience if you're coming home late. Your papillon might use them, but he's also getting a message that doing his business inside the house is fine if it's done on the pads. On the other hand, if your work or lifestyle involves constantly changing schedules, you might want to train your buddy to use the pads. With consistent training and a regular schedule, you may be able to achieve close to 100 percent housebreaking with your papillon. Even if he doesn't score a hundred percent, there's no reason -- except for underlying illness -- that your dog can't score in the 90s. His tiny bladder just can't hold urine if you're coming home late. If you know you'll be home later than usual, put your dog in a crate, or keep him in a contained area. Portable baby gates work well for creating barriers between papillons and valuable rugs. Consider hiring a dog walker if your schedule means you can't get back home in time to care for his needs. Pap911 Rescue and Adoption: Top 10 Reasons Why NOT to Own a Papillon! What Is It Called When You Are Obsessed With Cats?